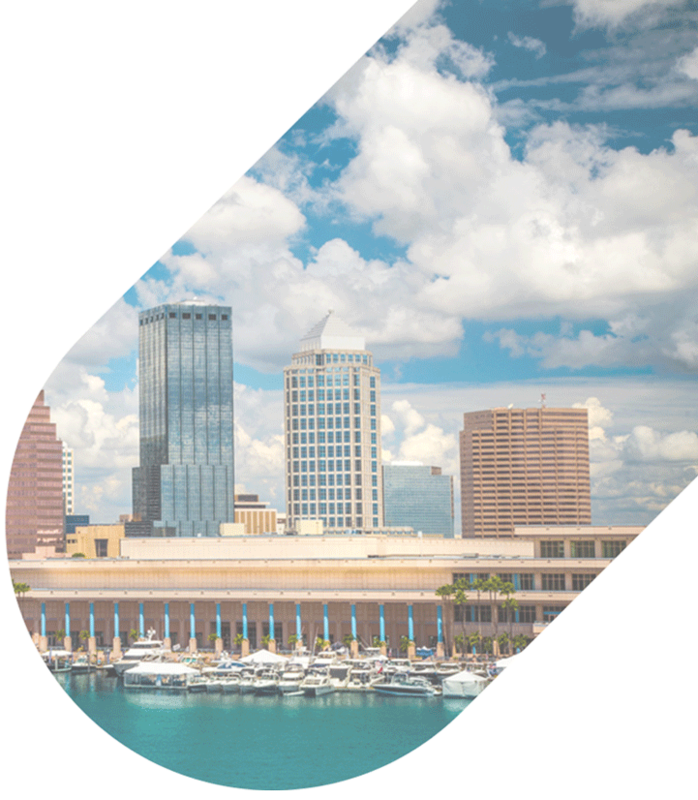 You can rely on National Charter Bus for efficient transportation to all of your upcoming Tampa events. When you partner with us, you’re getting the best selection of full-sized charter buses and compact minibuses. Call us today at 813-328-8085 for a free quote! Traveling to Tampa is easy with a personal charter bus. 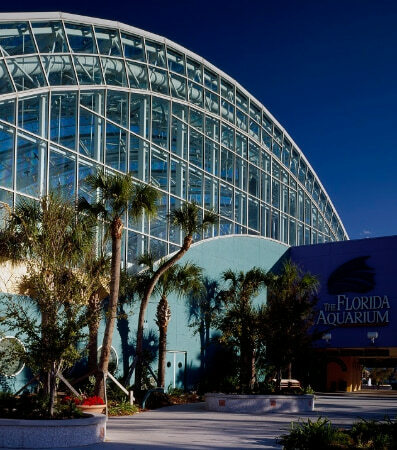 From your dolphin cruise at the Florida Aquarium to your family trip to Busch Gardens, we’ll be there to keep your itinerary running on schedule. Whether you’re heading in for a field trip, family reunion, business event, or wedding, we’ve got everything you need to get everyone here safely and efficiently. No matter the occasion, you’ll receive a quality charter bus rental from experts in the motorcoach industry. We can answer any questions you may have about bus transportation, and we’ll happily provide you with a custom quote. 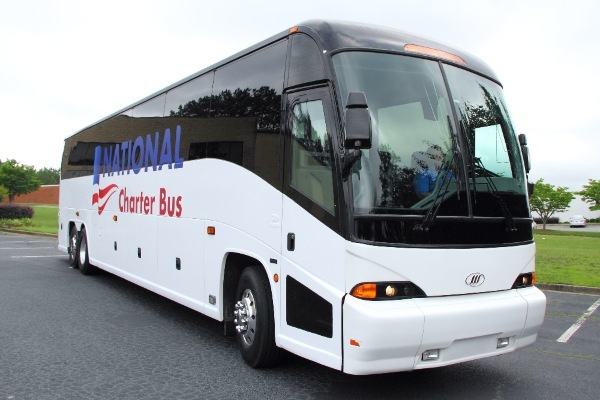 Let National Charter Bus make event planning easier than ever with personalized bus rentals and individualized attention throughout your booking process. Our reservation agents make it easy to streamline transportation to all large-scale events, whether it’s a corporate convention, wedding, family reunion, or another gathering. Buses range in size from 18-passenger to 56-passenger, with plenty of options in between to accommodate groups of all sizes. Choose from amenities such as WiFi and televisions with DVD players to keep young ones entertained, an on-board restroom to eliminate unnecessary stops, and reclining seats and extra legroom to make sure everyone travels in complete comfort. We’ll also make sure you’re matched with a driver who is experienced and knowledgeable about Tampa. Need a shuttle service between multiple venues? We’ll find a minibus just right for your group to transport you between hotels, restaurants, convention centers, and more according to your schedule. Instead of relying on public transportation, taxis, or rideshare apps, everyone in your group can enjoy personalized transportation that runs on your predetermined schedule and route. Whether you’re traveling with students, faculty members, sorority sisters, fraternity brothers, or classmates, we’ll make sure all of your school event travels are smooth and efficient. Take a more comfortable field trip with a modern charter bus outfitted with air conditioning, entertainment options, and an on-board restroom; enjoy a tour of your top college campuses; ride together to Greek events; or enjoy your next faculty meeting at your favorite restaurant, all with organized and efficient travel arrangements from National Charter Bus. Whether you’re a player or a dedicated fan, we’re here to make all of your travel to sporting events simple. From the Tampa Bay Buccaneers to the Tampa Bay Rays to any of your favorite local teams, we make it easy to schedule reliable transportation for your group. Teams love the extra storage space offered on full-sized coaches, while small groups of fans can enjoy a minibus and a personal driver to get them to the game in style. When the game’s over, everyone will be guaranteed a safe ride back home. We specialize in transporting groups of all sizes to sporting events all across Tampa. Once you plan the ins and outs of your Tampa getaway, we’ll put together a fleet just for you, ensuring that players, coaches, staff members, fans, and guests can all travel comfortably to the next game or event. If you’re traveling with a smaller group of fans, we recommend scheduling a compact minibus for a cost-effective alternative to public transportation. However, if you’re traveling with a large team, you may want to invest in a full-sized motorcoach model that can accommodate your team members with added legroom and storage space for optimal comfort. Wedding planning is stressful enough, from setting the guest list to picking a venue both you and your partner can enjoy. No need to stress over what kind of transportation you’ll need to transport guests to your wedding. National Charter Bus Tampa can work with your event’s unique needs to find the right wedding shuttle service for you. With the largest selection of bus rental options in Tampa, we can accommodate groups of any kind. Whether you just need a minibus to shuttle a few party members to and from your venue or a full-sized motorcoach to transport large groups or parties, our professionals can pair you with exactly what you need for an unforgettable wedding day. Keep wedding guests connected between event venues with your custom minibus. After your ceremony, while you take a few pictures with your new spouse, your bus can shuttle all guests to your reception space. That way no one will need to drive themselves or worry about getting lost along the way. When you’re ready, ride over to the reception yourself to get the party started. When you’re planning a big corporate event, it’s important that everything runs smoothly and goes according to schedule. Whether you’re planning a business meeting with special guests or organizing an industry conference in Tampa, National Charter Bus will provide your business group with the best transportation solutions possible. Your company won’t need to worry about renting multiple cars to accommodate employees throughout their time in Tampa. 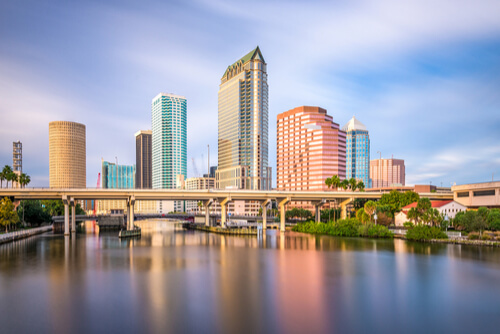 A private charter bus rental can comfortably fit your entire team while traveling for events at the Tampa Convention Center or other major business centers. We’ll easily shuttle everyone between the airport, hotels, meeting spaces, and any other location in the city. Keep your focus on upcoming opportunities and business endeavors while we handle the driving. With service extending across the nation, we’re your top choice for group travel from coast to coast. 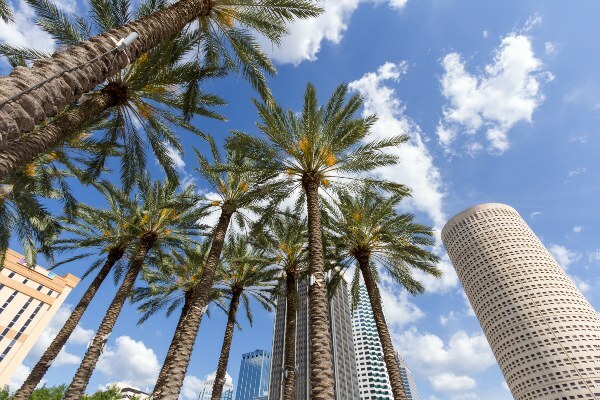 Service areas in Florida include Miami and Orlando, with other locations stretching to Atlanta, Chicago, Jersey City, Philadelphia, San Antonio, San Diego, and more. Rely on us for the perfect travel accommodations for your next trip across the nation. 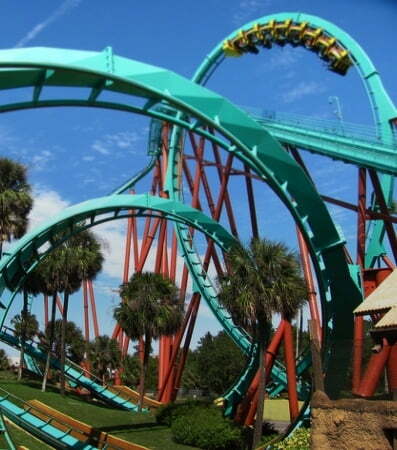 Booking is easy--just give us a call at 813-328-8085 with your itinerary in hand, and we’ll handle the rest. Leave the logistics to us while you focus on having a great trip! Our reservation agents are standing by 24/7 to take your call and find your perfect bus. Ride to this city-within-a-city for shopping, delicious food, Centennial Park, and more. Don’t leave without visiting the Ybor City State Museum to learn about Ybor’s connection to the cigar industry and immigrant communities. Centered around a 10-foot barbacoa grill and an in-house brewery, Ulele serves up savory dishes inspired by Floridian and Native American cuisine. Located on the University of Tampa’s campus, the Henry B. Plant Museum is a great destination for groups looking to learn more about the local history. Because the museum was once a popular hotel, you’ll also learn about tourism and the hospitality industry in the Victorian era. Edison is more than a restaurant--it’s a food lab. Chef Jeannie Pierola dreams up interesting and unusual creations, such as Jalapeno Cracker Jacks and Adobo Chicken and Pancakes, and brings them to life in her industrially decorated eatery. 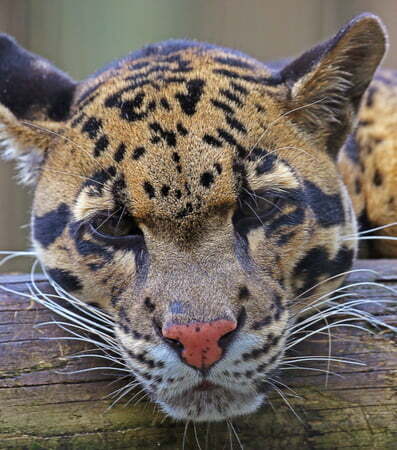 Visit this Big Cat Rescue, an animal sanctuary which houses over 80 lions, tigers, bobcats, cougars, and more, to learn more about the organization’s wildlife rescue efforts. At the Manatee Viewing Center in Apollo Beach--a quick bus ride from Tampa--you’ll learn about these gentle creatures, their habitat, and the conservation efforts of the organizations like Wildlife Conservation Commission. Shuffleboard, food, drinks, and friends--that’s what you’ll find at Tampa Heights’ Shuffle. The indoor shuffleboard establishment features 4 regulation sized courts and a concession stand style restaurant. For a relaxing afternoon activity, head to The Getaway. You’ll find tiki bars, paddle boarding, games, and more in a tropical atmosphere. Grab a bite to eat at Florida’s oldest restaurant, the historic Columbia Restaurant. It seats an impressive 1,700 people and includes a wine collection of 50,000 bottles. Each Monday through Thursday night, you can enjoy a Spanish Flamenco performance. If you’re in the area during football season, add the “Ray Jay” to your itinerary! Catch a Tampa Buccaneers or Florida Bulls game in this 65,000-seat venue.